CAMBRIDGE, Mass.--(BUSINESS WIRE)--AVEO Oncology (NASDAQ:AVEO) today announced the presentation of data from the Phase 3 TIVO-3 study of tivozanib (FOTIVDA®) versus sorafenib in refractory advanced or metastatic renal cell carcinoma (RCC). The data were presented by Brian Rini, MD, Professor of Medicine, Cleveland Clinic Lerner College of Medicine of Case Western Reserve University, and Director, Cleveland Clinic Genitourinary Cancer Program, during an oral presentation titled, “TIVO-3: A Phase 3, Randomized, Controlled, Multi-Center, Open-Label Study to Compare Tivozanib to Sorafenib in Subjects with Refractory Advanced Renal Cell Carcinoma (RCC)” at the 2019 American Society of Clinical Oncology (ASCO) Genitourinary (GU) Cancers Symposium held February 14-16, 2019 in San Francisco. A copy of the presentation will be available in the Publications & Presentation section of the Company’s website. The TIVO-3 trial is a Phase 3 randomized, controlled, multi-center, open-label study designed to compare tivozanib (FOTIVDA®) to sorafenib in 350 subjects with highly refractory advanced or metastatic renal cell carcinoma (RCC). The trial met its primary endpoint of demonstrating a statistically significant benefit in progression-free survival (PFS). Tivozanib demonstrated a 44% improvement in median PFS and 26% reduction in the risk of progression or death (Hazard Ratio [HR]=0.74, p=0.02, see Figure 1). 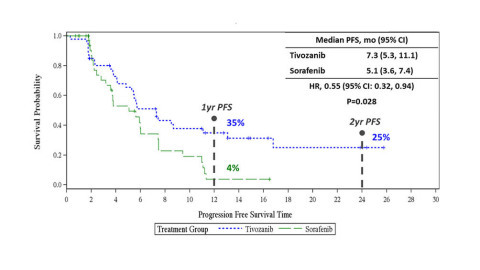 Median PFS was 5.6 months for tivozanib compared to 3.9 months for sorafenib. The TIVO-3 trial enrolled patients with RCC who have failed at least two prior regimens. Among these, approximately 26% of patients received checkpoint inhibitor (CPI) therapy in earlier lines of treatment. PFS for tivozanib was longer than sorafenib both in patients who received prior CPI therapy and those who received two prior VEGF TKI therapies. Patients who received prior CPI therapy had a median PFS of 7.3 months with tivozanib and 5.1 months with sorafenib (HR=0.55, p=0.03, see Figure 2). One- and two-year PFS in patients who received tivozanib following CPI therapy was 35% and 25%, respectively, and 4% and n/a for patients receiving sorafenib following CPI therapy at those respective time periods. The secondary endpoint of overall response rate for patients receiving tivozanib was 18% compared to 8% for patients receiving sorafenib (p=0.02). 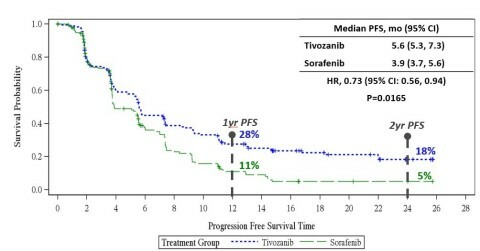 Median duration of response (DOR) in patients receiving tivozanib was not reached (95% CI:12.9,---) and was 5.7 months for patients receiving sorafenib (95% CI:5.6,---). DOR probability at 1 year was 71% and 46% for tivozanib and sorafenib, respectively, and 55% and 0% at two years. The analysis of the secondary endpoint of overall survival (OS) was not mature at the time of the final PFS analysis, and currently reflects ~50% of potential OS events. As previously disclosed, the updated preliminary OS analysis conducted at an October 4, 2018 data cutoff date, which included additional patients previously lost to follow-up, showed a non-statistically significant difference in OS favoring sorafenib (HR=1.12, p=0.44). The Company intends to conduct an additional interim OS analysis in August 2019, the results of which are expected to be reported in the fourth quarter of 2019. Tivozanib was generally well-tolerated, with grade 3 or higher adverse events consistent with those observed in previous tivozanib trials. Infrequent but severe adverse events reported in greater number in the tivozanib arm were thrombotic events similar to those observed in previous tivozanib studies. The most common adverse event in patients receiving tivozanib was hypertension, an adverse event known to reflect effective VEGF pathway inhibition. Tivozanib (FOTIVDA®) is an oral, once-daily, vascular endothelial growth factor (VEGF) tyrosine kinase inhibitor (TKI) discovered by Kyowa Hakko Kirin and approved for the treatment of adult patients with advanced renal cell carcinoma (RCC) in the European Union plus Norway and Iceland. It is a potent, selective and long half-life inhibitor of all three VEGF receptors and is designed to optimize VEGF blockade while minimizing off-target toxicities, potentially resulting in improved efficacy and minimal dose modifications.1,2 Tivozanib has been shown to significantly reduce regulatory T-cell production in preclinical models3, and has demonstrated synergy in combination with nivolumab (anti PD-1) in a Phase 2 study in RCC. Tivozanib has been investigated in several tumor types, including renal cell, hepatocellular, colorectal and breast cancers. AVEO Pharmaceuticals, Inc. (the “Company” or “AVEO”) is a biopharmaceutical company dedicated to advancing a broad portfolio of targeted medicines for oncology and other areas of unmet medical need. The Company’s strategy is to retain North American rights to its oncology portfolio while securing partners in development and commercialization outside of North America. The Company is seeking to develop and commercialize its lead candidate tivozanib in North America as a treatment for advanced or metastatic renal cell carcinoma (“RCC”). The Company has outlicensed tivozanib (FOTIVDA®) for oncological indications in Europe and other territories outside of North America. Tivozanib is approved in the European Union, as well as Norway and Iceland, for the first-line treatment of adult patients with RCC and for adult patients who are vascular endothelial growth factor receptor and mTOR pathway inhibitor-naïve following disease progression after one prior treatment with cytokine therapy for RCC. In addition, a new formulation of tivozanib is being explored in ocular conditions. The Company has entered into partnerships for the development and commercialization of AV-203 (CAN017) and ficlatuzumab, both clinical stage assets in oncology. The Company is currently seeking a partner to develop the AV-353 platform, a preclinical asset, worldwide for the potential treatment of pulmonary arterial hypertension and oncology. The Company has recently regained the rights to its AV-380 program for the potential treatment of cachexia and is initiating toxicology studies to support the filing of an initial new drug application and advance the program’s development. This press release contains forward-looking statements of AVEO that involve substantial risks and uncertainties. All statements, other than statements of historical fact, contained in this press release are forward-looking statements. The words “anticipate,” “believe,” “expect,” “intend,” “may,” “plan,” “potential,” “could,” “should,” “would,” “seek,” “look forward,” “advance,” “goal,” “strategy,” or the negative of these terms or other similar expressions, are intended to identify forward-looking statements, although not all forward-looking statements contain these identifying words. These forward-looking statements include, among others, statements about: AVEO’s plans to make a NDA filing decision following the availability of more mature OS results; AVEO’s plans to complete an interim OS analysis for the TIVO-3 trial in August 2019 and to report the results of this analysis in the fourth quarter; AVEO’s plans to present TIVO-3 data at ASCO GU; AVEO’s expectation that the OS outcome will be more mature by August 2019; AVEO’s hope that the positive PFS outcome will translate into an improved hazard ratio; AVEO’s intent to continue to work with the FDA to determine tivozanib’s risk-benefit profile as a single agent in RCC; the efficacy, safety, and tolerability of tivozanib, as a single agent and in combination with other therapies in several indications, such as RCC and HCC; AVEO’s plans and strategies for commercialization of tivozanib in the United States and Europe; AVEO’s plans to develop the AV-353 platform; AVEO’s plans regarding AV-380 and AVEO’s other strategy, prospects, plans and objectives for its product candidates and for the Company generally. AVEO has based its expectations and estimates on assumptions that may prove to be incorrect. As a result, readers are cautioned not to place undue reliance on these expectations and estimates. Actual results or events could differ materially from the plans, intentions and expectations disclosed in the forward-looking statements that AVEO makes due to a number of important factors, including risks relating to: AVEO’s ability, and the ability of its licensees, to demonstrate to the satisfaction of applicable regulatory agencies such as the FDA the safety, efficacy and clinically meaningful benefit of AVEO’s product candidates, including, in particular, tivozanib; AVEO’s ability to successfully file an NDA for tivozanib; and AVEO’s ability to enter into and maintain its third party collaboration and license agreements, and its ability, and the ability of its strategic partners, to achieve development and commercialization objectives under these arrangements. AVEO faces other risks relating to its business as well, including risks relating to the timing and costs of seeking and obtaining regulatory approval; AVEO’s and its collaborators’ ability to successfully enroll and complete clinical trials; AVEO’s ability to maintain compliance with regulatory requirements applicable to its product candidates; AVEO’s ability to obtain and maintain adequate protection for intellectual property rights relating to its product candidates; AVEO’s ability to successfully implement its strategic plans; AVEO’s ability to raise the substantial additional funds required to achieve its goals, including those goals pertaining to the development and commercialization of tivozanib; unplanned capital requirements; adverse general economic and industry conditions; competitive factors; and those risks discussed in the sections titled “Risk Factors” and “Management’s Discussion and Analysis of Financial Condition and Results of Operations—Liquidity and Capital Resources” included in AVEO’s quarterly and annual reports on file with the Securities and Exchange Commission (SEC) and in other filings that AVEO makes with the SEC. The forward-looking statements in this press release represent AVEO’s views as of the date of this press release, and subsequent events and developments may cause its views to change. While AVEO may elect to update these forward-looking statements at some point in the future, it specifically disclaims any obligation to do so. You should, therefore, not rely on these forward-looking statements as representing AVEO's views as of any date other than the date of this press release. Any reference to AVEO’s website address in this press release is intended to be an inactive textual reference only and not an active hyperlink.